Hamstring stretches, also known as hip stretches, are primarily used to reverse the negative effect of tight hamstring muscles on the lower back, pelvis and legs. Any group of lower back stretches to be complete and effective must include hamstring exercises that stretch and relax this group of large muscles that are essential to good posture. You will see repeatedly in this article that hamstring stretching exercises, as well as all back stretching exercises, must be done slowly and gently in order to avoid injury to the lower back and to accomplish the greatest lower back pain relief. The hamstring muscles are actually a group of three individual muscles located on the back of the thighs. They begin in the general area of the pelvis and lower buttocks and end at the back of the knees. Because this group of three large muscles are attached at one end to the mid and lower part of the pelvis and to the knee at the other end, when they develop a problem of any sort they can change the way the pelvis moves (or does not move). For this reason hamstring stretches are important to common activities like walking, rising up from the seated position, bending over at the waist, climbing stairs and similar activities. In medical practice we say that shortened hamstring muscles will alter normal mechanics of the pelvis and low back, as well as the position of the hips in relation to each other. This is why the hamstring muscles are known as fundamental muscles of posture. Any abnormality of these postural muscles can lead directly or indirectly to a host of painful problems in most any part of the body. Think of it this way: The hamstring muscles are important for pelvis, hip and leg movement. The hip joints should have a lot of natural movement in them, and the three bones of the pelvis have a much smaller amount of movement between them. All this combined movement is essential in order for you to move the lower half of you in a fully normal, natural and pain-free way, as well as to stand straight and be balanced while you are on your feet. These hamstring muscles are attached to these moveable bones in such a way that they create the actions of walking, bending, sitting, climbing, etc. But when these same hamstring muscles become shorter or less able to relax or contract normally they will alter the movement they are responsible to produce, resulting in poor mechanics and nerve irritation. Over time this reduced movement causes the joints of the hips and pelvis to become irritated due to abnormal movement and reduced use. When this happens the altered mechanics of the hips and pelvis will influence the spinal column that rests on top of the pelvis to have altered and reduced movement also. In addition the spine can display a sideways curve (scoliosis) or an exaggerated forward curve (hyperlordosis) due to problems with the hamstring muscles because they no longer balance posture well. This chain of events that cause painful changes of body posture and body mechanics sometimes happens quickly or slowly. Either way, complex postural changes will usually happen over time because the body is so interconnected. No no area of the body is isolated from its neighboring areas. With this in mind it is easy to understand how tight and short hamstring muscles can have a profound effect on the start of headaches or foot pain or anything in between; and especially correcting this shortness with hamstring stretches can improve many painful low back and leg postural problems. Lastly, before any hamstring stretch exercise is described, it is really important that you know you must do these muscle stretches correctly in order for them to be effective. Keep in mind that force is seldom effective to relax or lengthen any tense or contracted muscle in the body. We all possess an automatic and uncontrollable defense mechanism against being stretched out too fast or too far by too much force. If the hamstring stretch and traction is light and gentle the body does not become alarmed and the favorable reaction to stretching can take place faster and more thoroughly than if an aggressive force is applied. To effectively reduce the tight contracted state of any muscle it is far more effective to use a gentle or small amount of traction that should be applied over a long time; light traction or stretch applied for a long time is always more effective than a large or forceful stretch applied over any length of time. The idea is to use a small stretching force gently applied in order that no internal resistance or tensing of the muscles occurs. It is almost like you are trying to sneak up on the shortened muscle with such a small amount of force that the body does not ever tense up to protect itself. A light hamstring stretching force is used because it will not trigger the automatic self-defense mechanism that results when forceful stretching is used. The mindset that you should have when you begin stretching is to “allow” the body to relax and “allow” the tight area to lengthen; it is as though you are giving permission to the tight area to give in to the slight force that is being used. You want to deliberately lower your guard to allow the release of the tight tissue by a stretching force that is so minor. You should not aggressively try to stretch out a tight muscle because not only can this approach cause injury to the area, but it will not be successful. The body will always – always – resist an aggressive and forceful effort to lengthen a tight or shortened muscle. Forceful hamstring stretching is fought by the body because it affects the tissue something like an injury that is being done in slow motion. What happens when the body is in the process of falling or a joint is being twisted and taken beyond its normal range of movement? The body automatically guards and tenses the area being forcefully stretched in an effort to protect it. This is exactly what happens when a person tries to use force to stretch out tight tissue. Just tell yourself, “It is OK to let go. I feel safe with this light stretching force because I am in control of it. I will stop immediately if I feel any pain. I can give in to the gentle pull I feel in the tight area because I am fully in control of what I am doing. It will not harm me to slowly and carefully let go a little bit at a time. I can allow the stretching to make my muscles less tight because it feels so good to let them relax after being tight for so long…” This mental dialogue helps tremendously to get more accomplished than using large traction and stretching force. Forceful stretches provoke an even greater internal resistance that is used to protect the body against sudden and aggressive stretching. It is like the harder you try to stretch a tight muscle, the harder your body will resist to protect it – and the defense mechanism that responds as though you are being injured will always win. Light and gentle traction will always get more done than heavy and forceful traction, OK? Any and all of these stretches can reduce hamstring tension and shortening. To determine which one or two you wish to use, you will first need to experiment a bit. Spend a minute or two doing each of these carefully, slowly and gently, while paying very close attention to how your back and hamstring area feels while you are doing each one. You are attempting to find just one or two that feel comfortable to do, that do not feel like you are stressing or putting your back in jeopardy while you are doing the stretches; your body will give you feedback to let you know which might be too much for you and which might actually do you some good. Pay attention to what your body is telling you when you do these hamstring stretches to determine how to proceed. Do not overstretch or put yourself in a position where you feel like your back or hamstring muscles are being injured. To develop the greatest amount of hamstring stretching it is critical that you are relaxed as much as possible, not tense. Pain creates a strong reaction of involuntary guarding and tension that prevents muscle lengthening. For these reasons best results occur when these hamstring stretches are done lightly, gently and for a prolonged amount of time. Never force anything to happen; give your body permission to let go and stretch out as much as it wants at the time to the gentle force of gravity working on the body. Think more about relaxing the muscles and letting go of tension while you do these hamstring stretches. If you do you will you will accomplish much more than than if you only think about the act of stretching tight muscles. All of these stretches for tight hamstring muscles should be done for a few minutes, twice each day – early in the morning before your daily activities begin, and again at the end of the day. If your back starts to give you trouble while you are working, stop and do a few minutes of hamstring stretching in the middle of the day to get needed relief. This is the easiest and least stressful way to stretch the hamstrings. Lie face up on the floor with a pillow under your head, and with your buttocks close to a wall; you are not lying alongside the wall; you are at right angles to the wall, facing the wall except that you are on the floor looking up at it. Place the heel of one foot and then the other heel of the other foot on the wall. In this position your upper body is in contact with the floor but you lower buttocks and legs are elevated and held up by you placing your heels on the wall. The amount of stretching you feel in the low back and behind your needs can be controlled by how close you are to the wall your legs are resting on. To create less stretch you must move your body away from the wall; to create more stretch you must move your body toward the wall. Once you find a place that creates mild and gentle stretch in the hamstring area of the back of the thighs and low back, just settle there for several minutes and enjoy the sensation of the muscles being slowly lengthened. If you notice after a few minutes that the gentle stretching sensation is gone, then simply bring your buttocks an inch or two closer to the wall to begin the stretching process again. Eventually you will get your buttocks up against the wall at the corner where it meets the floor. To stretch your hamstring and low back muscles even further, all you have to do is place a pillow behind your heels as you rest them on the wall; the pillow will bring your heels further from the wall. This will once again create a stretch on the legs and low back. It is a good idea to choose a room and a wall in your house that is close to a television so you can relax while you are doing this wall hamstring stretch. Time will pass by faster and you are more likely to spend enough time doing your stretches to do your back some real good. This is a good way to stretch the hamstrings if you have good arm strength and can control a tendency to try too hard; pulling too much with the arms can cause overstretching and injury to the low back; if you are confident you will not overstretch using this method, it is very useful. Lie on your back in bed or on the floor with a full size bath towel (or a belt) in your hand. Fold the towel in half and hold the two ends together. 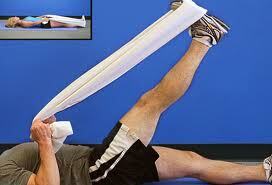 Put the foot of the leg you want to stretch in the folded or “U” end of the towel. (Or do something similar with a belt.) Using both hands pull the leg up that you want to stretch and straighten that leg by bringing the towel up and making it shorter. One leg is stretched at a time, although two could be done if you have very strong hands and arms. Just as with the other hamstring stretching maneuvers, do not work at this. To get the most out of this kind of muscle stretching you have to be relaxed, not tense. Pain causes tension and an involuntary reaction of guarding that prevents muscle lengthening; this is why you need to do these stretches lightly and gently. Let your arms do the work. Do not force anything to happen; give your body permission to let go and stretch out as much as it wants at the time. At the beginning do this stretch for about 10 seconds; as time goes on and your back is more relaxed you can hold the stretch longer if it feels good when you straighten up. More controlled than the other methods to stretch the hamstring muscles. This method also applies less strain to the lower back. One or two legs can be done at a time. Sit on a firm bottom straight back chair. Place another chair or object of about the same height in front of you. With the tight leg up on this support, comfortably bend forward toward your toes. Allow your head and shoulders to come down toward your raised leg. nothing to happen, just let it happen; give your body permission to let go and stretch out as much as it wants a the time. Not as efficient as doing both hamstrings at the same time, but this one-leg version might be better if you know that one leg in particular is your problem. Stand on one leg, and place the opposite foot straight ahead onto a surface that is at least the height or your waist or more. With the tight leg up on this support, comfortably bend forward toward your toes. Allow the weight of your head and shoulders to bring your upper body down toward your raised leg, do not force this action. Just as with the other hamstring stretching maneuvers, do not work at this; relax into it using gravity and your upper body weight to stretch your low back and thigh muscles; force nothing to happen; give your body permission to let go and stretch out as much as it wants at the time. At the beginning do this stretch for about 10 seconds; as time goes on and your back is more relaxed you can hold it longer. Repeat this one-leg hamstring stretch for the opposite leg to keep your back equally relaxed and flexible on both sides. This is perhaps the next most common stretching technique for tight hamstrings. Sit on the floor with your legs together and straight out in front of you, with the toes pointed toward the ceiling. Just as in the standing stretch, simply allow the weight of your upper body allow you to bend forward and bring your top half closer to your bottom half in a gentle and relaxing forward flexion. If you feel like you need to bend your knees slightly to keep your low back comfortable, bend your knees only enough to keep your low back relaxed and pain free. As before, bend forward at the waist so you only feel a comfortable and non-threatening stretch in the hamstring, buttock and low back muscles. Stay always within your comfort range so you are feeling only a slight pulling sensation in the low back, pelvis and thigh region. Do not bounce your back up and down or force anything to happen; let the weight of your body to bring you slowly forward and down. Start in this sitting stretch posture for perhaps 10 seconds or so at the beginning; as your flexibility increases and your tissue responds by lengthening and relaxing, you will be able to stay flexed forward for as long as you are comfortable and feel no urgency to straighten up. Give your body permission to relax and let go and soon you will feel the tension in the hamstring, pelvis and low back release and you will slump forward into a deeper flexed posture. If it does not happen immediately, who cares? You are not in a race. It is just you relaxing and gently reaching a level of comfort with tight tissue you have previously ignored. In time you will be repaid with less pain and greater flexibility than you have had in a long time. This is perhaps the most common technique, but also the one that people tend to abuse. In this simple maneuver: while you are standing you bend over at the waist, with your feet together, as though you are trying to touch your toes. It is not important that you actually ever do touch your toes. Who cares if you never touch your toes? But you probably will in time gain that much flexibility to be able to reach your toes. All you have to do is simply bend over and relax into a comfortable and relaxing forward flexion of the low back and hips, with the weight of your arms and head gently bringing you slowly down closer to your toes than when you started. It is critically important that you do not use any effort or muscle exertion to bring your fingers closer to your toes; no deliberate work is done to bend over further – you simply use the weight of your upper body to slowly and gently stretch your low back and hamstring muscles at a pace that is good for you. Let gravity do the work while you relax and think about letting all the tension and resistance out of your body. If you feel like you want to, or need to, bend your knees slightly to reduce the tension across your low back while you are bending forward, go ahead. Bend your knees to protect your back if you feel that your back is giving you signals that you should. Maybe in time you will be able to keep your knees straight, but for now bend them so you only feel a gentle stretch in the hamstring muscles of the thigh and buttock and the tight low back muscles. Never bounce up and down or try to force greater movement than is natural for you. Bend over only far enough to feel a slight but comfortable pulling sensation in the low back, hamstrings and back of your knees. Stay within the narrow range of feeling that slight pulling sensation – never pain or a sharp pulling sensation. Never force anything to happen; just let your body weight nudge you slowly toward better low back and hamstring flexibility. Stay in that posture for perhaps 10 seconds or so when you start doing this kind of stretching; later you can stay longer if you feel good about it and stay flexed forward as long as you are comfortable and feel no urgency to straighten up. 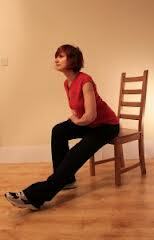 In time you will feel yourself begin to loosen the tension in the hamstring, pelvis, low back and knee regions. Without even trying your fingertips will get closer to your toes. If they do not get closer, who cares? Just relax and know you are gently stretching the guilty tissues for maybe the first time in our life. You are on a journey of regaining control over this tight and contracted tissue and you will feel better very soon because of what you are doing now.